Offering this just in time before Easter! 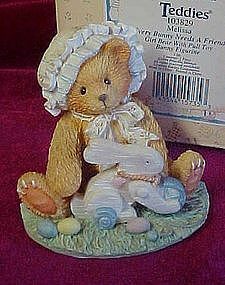 This is Cherished Teddies figurine Mellissa. Every Bunny needs a friend. 1994 Patricia Hillman,Cherished Teddies figurine Number: 103829. 3" tall, excellent condition with no chips, cracks, or repairs! Comes with original box and certificate of adoption.